Arc blast and arc flash are serious enough job hazards for so many workers. Both the National Fire Protection Association (NFPA) and Occupational Safety and Health Administration (OSHA) have ongoing campaigns to improve worker education, training, and understanding of these potentially fatal events. NFPA 70E, the standard related to electrical hazards, includes ways to make hazard identification and risk assessments, select personal protective equipment (PPE), and more. NFPA’s 2015 version of 70E has major changes, so keeping current on risk prevention is especially important. Though not a law, NFPA 70E forms the basis for OSHA’s federal regulations on worker protection. NFPA establishes the safety guidelines that OSHA requires — while NFPA is not law, OSHA’s regulations are. Though a worker may have run through the information dozens of times, consciously knowing and reviewing the approach boundaries for equipment under and over 600 volts is a routine that could save a life. A properly trained worker can readily ask a facilities manager or owner if the boundary has been calculated using IEEE’s standard or another acceptable method (since NFPA does not stipulate how the boundaries are determined). Personal Protection Equipment (PPE) made available by the employer must match the levels of risk derived from some industry standard. The employee, not just the employer, has a responsibility to be aware of risks on the job. Proper education includes knowledge of potential risks, how to establish approach boundaries, and how to use safety equipment to minimize risk of arc flash. PPE is the last line of defense in keeping workers safe from arc blast and arc flash. Still, no job should begin with a worker approaching electrical equipment without the most basic PPE, such as eye protection and voltage rated gloves. PPE is one component of safe electrical work, but certainly the right safety equipment beyond the worker is needed, too. Proper labeling, for example, is a great step toward preventing arc flash. The online publication EHS Today points out that proper labeling of electrical equipment is not simply a good idea, it is law. Lockout and tagout, testing before touching, and other procedural safety steps can keep you safe near electrical equipment. The testing device, too, has to be checked. This essential piece of safety equipment can itself become an arc flash hazard if, for example, leads to a 600-volt multimeter are touched to a 2,300-volt circuit. Some equipment is deliberately designed so that the maintenance worker cannot access the interior electrical components without de-energizing the unit. The handle to open a cabinet door, for example, can be the unit’s circuit breaker. 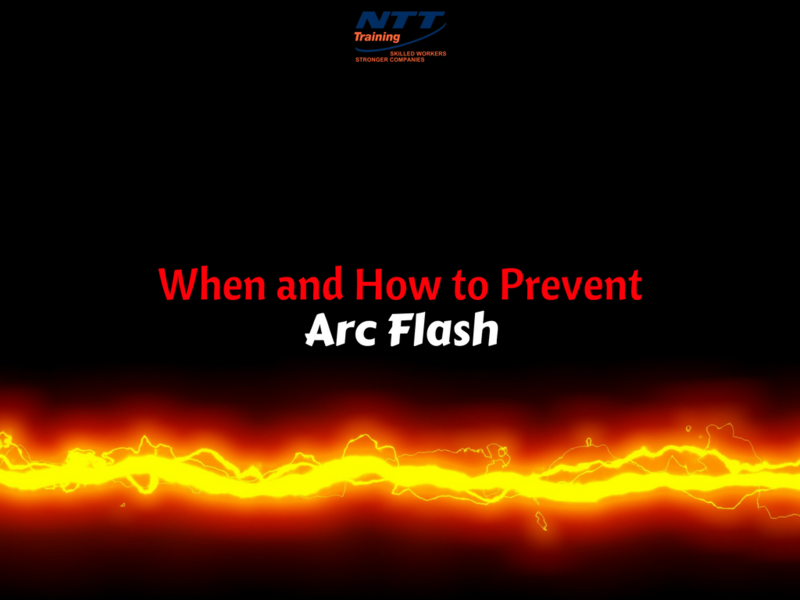 This helps prevent arc flash by allowing maintenance on the now de-energized equipment. The right safety equipment, correctly used, can prevent arc flash. Learning to use hot switch sticks, discharge sticks, and other equipment at the right time can save your own or another worker’s life. An educated worker is a safer worker. The obligation to perform electrical work safely falls equally on the employer and employee. Attending NTT’s two-day seminar on NFPA 70E: Arc Flash Electrical Safety Training will prepare all stakeholders in the updated NFPA 70E standards, OSHA regulations, and proper procedures. Contact NTT Training today to learn more about this informative seminar!